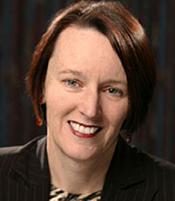 Christine O’Keefe completed a Bachelor of Science at the University of Adelaide in 1981, and a Bachelor of Science with First-Class Honours in Pure Mathematics at the University of Adelaide, Australia, in 1982. In 1985, she was Tutor in Pure Mathematics at the University of Adelaide, concurrent with her PhD research. She was awarded a PhD in Pure Mathematics by the University of Adelaide in 1988, for a thesis entitled ‘Concerning t-spreads of PG((s+t)(t+1)-1,q)’ under the supervision of LRA Casse. Christine’s candidature included spending one year at the University of Rome under an Italian Government Exchange Scholarship. Following the completion of her PhD she moved to the University of Western Australia as a Lecturer then Research Fellow (1989-90), and returned to the University of Adelaide as a Lecturer and Senior Lecturer (1991-94). From 1995 to 2000, she held an ARC Queen Elizabeth II Fellowship and a Senior Research Fellowship at the University of Adelaide. During this time, she was a Visiting Professor of the National Research Centre (CNR), Italy and a Foreign Researcher at the University of Ghent, Belgium. In 2000, Christine was looking for a career change, and joined the CSIRO Division of Mathematical and Information Sciences, now CSIRO Mathematics, Informatics and Statistics (CMIS) as a Research Scientist in Business Intelligence. In 2002, she founded the Information Security and Privacy group in the CSIRO ICT Centre. In 2004, she assumed leadership of the Health Informatics group within CMIS and in 2006 she became the inaugural Theme Leader for Health Data and Information in the Preventative Health National Research Flagship. Christine became the Strategic Operations Director for the Flagship in 2008. She gained an MBA from the Australian National University in 2008. During her studies she was awarded the Accenture Prize for Corporate Strategy in 2005, the Acumen Alliance Prize for Entrepreneurship and New Venture Planning in 2007 and the Sir Roland Wilson Prize, for Leadership and Outstanding Results in 2008. Christine was seconded part time from CSIRO in 2009-10 to be the inaugural Director of the Population Health Research Network Centre for Data Linkage, funded by the Australian Government National Collaborative Research Infrastructure Strategy and located in Curtin University, Perth. During this time she was a Professor of the Faculty of Health Sciences. Since July 2010, she has been Science Leader for Privacy and Confidentiality in CSIRO Mathematics, Informatics and Statistics. She holds a CSIRO Newton Turner Career Award (2010-11), designed to further the scientific careers of exceptional senior scientists at CSIRO who have demonstrated outstanding scientific achievement. By 2010, she was the author of more than 100 publications including 65 refereed journal articles, 23 refereed conference proceedings and 53 technical and client reports. Her lifetime ISI citations numbered more than 290 and her ISI h-index was 9. Before joining CSIRO, Christine enjoyed an international research career in finite geometry and its applications, which draws on techniques from algebra, discrete mathematics and combinatorics. She has also investigated the application of geometric techniques in other related fields such as design theory, the modelling of spatial memory and information security. In 2010, her research interests lay in the area of privacy technologies and disclosure control being particularly interested in designing analysis output which does not compromise confidentiality or privacy, and in developing quantitative measures for disclosure risk, information loss and data utility. She has also worked on implementing consent for access to personal information in electronic form, privacy-preserving linkage protocols and developing theory-backed standards for protecting individual privacy and confidentiality in health data research. In the related area of information security she has made contributions to the theory of Secret Sharing Schemes, which allow only certain predetermined groups of participants to together obtain a secret key, while preventing any leakage of information to unauthorised groups. Christine serves on the Australian Privacy Advisory Committee and on the ACT Health and Medical Research Council. She is an Associate of the Confidentiality and Privacy Research Group at the University of Manchester, UK. Christine was awarded the Hall Medal of the Institute for Combinatorics and Applications in 1996, for outstanding contributions to the field, and the Australian Mathematical Society Medal in 2000 for distinguished research in the Mathematical Sciences (see the citation available by following the link in the Related information below). As the first woman to win the Australian Mathematical Society Medal, Christine was honoured with inclusion on the National Pioneer Women’s Hall of Fame Signature Quilt, A Patchwork of Empowerment. O’Keefe C, 2010, Personal communication.